Pistons for medium speed trunk piston engines which burn residual fuel are composite pistons; i.e the crown and the skirt are made of different materials. The crown is a heat resisting steel forging which may be alloyed with chromium, molybdenum and nickel to maintain strength at high temperatures and resist corrosion. It is dished to form a combustion chamber with cutouts to allow for the valves opening. The topland (the space between the top ring and the top of the piston) may be tapered to allow for expansion being greater where the piston is hottest. The skirt can either be a nodular cast iron or forged or cast silicon aluminium alloy. Aluminium has the advantage of being light, with low inertia, reducing bearing loading. However because aluminium has a higher coefficient of expansion than steel, increased clearances must be allowed for during manufacture. This means that the piston skirt clearance in the liner is greater than that for cast iron when running at low loads. The skirt transmits the side thrust, caused by the varying angularity of the con rod, to the liner. Too big a clearance will cause the piston to tilt. The piston pin for the con rod small end bearing is located in the piston skirt. The piston pin floats in the piston skirt and is located in place by circlips. Depending on the material used for the skirt (esp. cast aluminium), a bushing may be used for the pin. 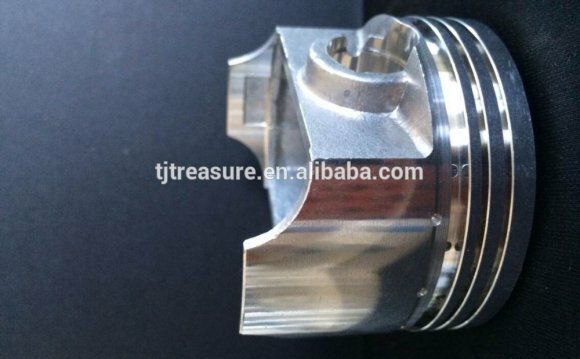 The piston rings may be located in the crown or in both crown and skirt. Normally, the rings are chrome plated or plasma coated to resist wear. Because the liner is splash lubricated, an oil scraper (oil control) ring is fitted to the piston skirt. The piston is oil cooled. This is achieved by various means; The simplest is for a jet of oil to be directed upwards from a hole in the top of the con rod onto the underside of the crown. A more efficient method is to use an oil catcher as shown in the picture above. This directs oil into the cooling spaces on the underside of the crown where the cocktail shaker effect of the reciprocating piston ensures a positive cooling effect. It is unusual for the oil return temperature to be monitored (unlike the 2 stroke slow speed crosshead engine, where both temperature and quantity are monitored). The Limbach L2400 are a series of German piston aero-engines designed and built by Limbach Flugmotoren. It is a 4-cylinder, 4-stroke air-cooled flat piston engine typically between 93-130 hp (69.4-97 kW) power output.